Volgodonsk, Rostov Oblast, Russia: It's a mega manufacturing facility, the covered area of which is the size of several football fields. A road runs through the shop floor at the unit of Atomenergomash, a subsidiary of Rosatom, Russia's state atomic energy corporation. And workers use bicycles to commute between workstations. 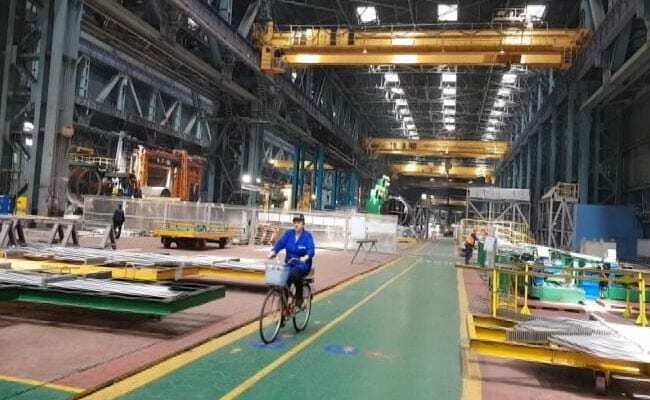 This manufacturing hub in the city of Volgodonsk supplies 6000 tonnes of heavy equipment needed for each of the six giant Russian-made nuclear reactors that will finally come up in Tamil Nadu's Kudankulam. Each of the 1000-megawatt reactors costs over Rs. 40,000 crores and delays can push the price upwards. "We are very sure we deliver our main equipment on time. Right now, we have produced a lot of equipment and we are ready to send it by end of this year. We are looking for contracts for Kudankulam 5 and 6 and we hope to sign them this year", Andrey Nikipelov, CEO of Atomenergomash, told NDTV. The components, crafted with special steel, are made to work for at least 60 years which is the active life of a nuclear reactor. Much of the equipment still needs to remain intact for hundreds of years after the plant has been shut down. It takes up to two years to make the over-300-tonne pressure vessels. A quality control inspector from Nuclear Power Corporation of India (NPCIL) stationed at the plant keeps a daily watch over the equipment to ensure that manufacturing standards are strictly adhered to, something no other country does. "Sometimes, Indian customer over-controls some special equipment, which is not so good for production but is good for the customer", said Mr Nikipelov. The first pair of functional reactors at Kudankulam, generating about 2000 MW of power that is fed into the southern grid, cost around Rs. 20,000 crore. The next pair --- Kudankulam 3 and 4 would end up costing about Rs. 40,000 crores and the last pair may not cost less than Rs 50,000 crores, say experts at NPCIL. In the 2014 Indo-Russian 'Strategic Vision' document on nuclear cooperation, the two countries have committed to building 10 more nuclear reactors in the next two decades. These could be installed at a large nuclear power park, possibly in Andhra Pradesh.